Our Jaalee Cloud allows you to configure and manage your JAALEE. The Jaalee Cloud is also the place where you can find your Api-Key in your profile page. First, sign up on https://cloud.jaalee.com or https://www.jaalee.com to get a JAALEE account, then you can log in this account on https://cloud.jaalee.com. If you already have a JAALEE account, you can just use it to log in on https://cloud.jaalee.com or eBeacon. 1. If you have a order number, you can just log in your JAALEE account on https://cloud.jaalee.com and then click the “Add more JAALEE”button, and then input your order number. The background system will bind all the JAALEE slim Beacon to your account. 2. Use eBeacon app to bind your JAALEE slim Beacon to your JAALEE account. First, download eBeacon app in Apple app store. Next, log in your JAALEE account in eBeacon app, and then bind your JAALEE slim Beacon according to cue. Third, configure JAALEE slim Beacon by eBeacon app, and integrate IOS SDK to your own app. 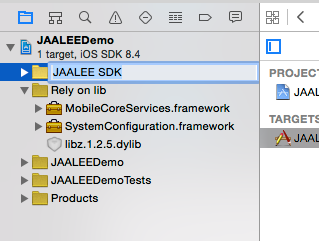 The latest version of the JAALEE iOS SDK is 1.0 and was released 17 September 2015. This document shows you a quick way to start using the JAALEE iOS SDK in apps. You will find code examples for core features, and best practices that developers should follow. You can find more detailed information in the JAALEESDK Appledocs. 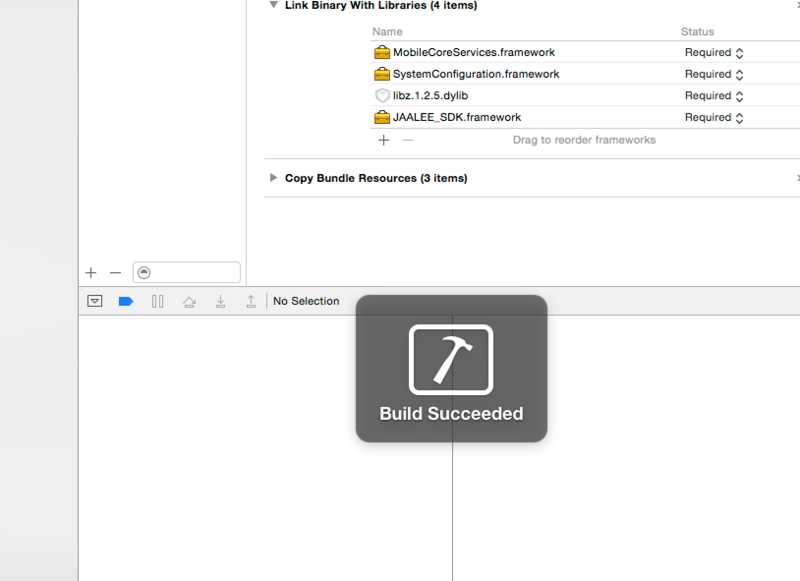 In this section we'll run through the steps to add our SDK to your Xcode project. If this is your first time out with Xcode and iOS App development, then we recommend you read Apple's introductory guide. Clone the git repo - git clone attach github https://github.com/jaalee/JAALEE-IOS-SDK.git or download the zip file. 1. Create a new project in Xcode and give it a name. 2. Create an empty folder in your project directory. 3. 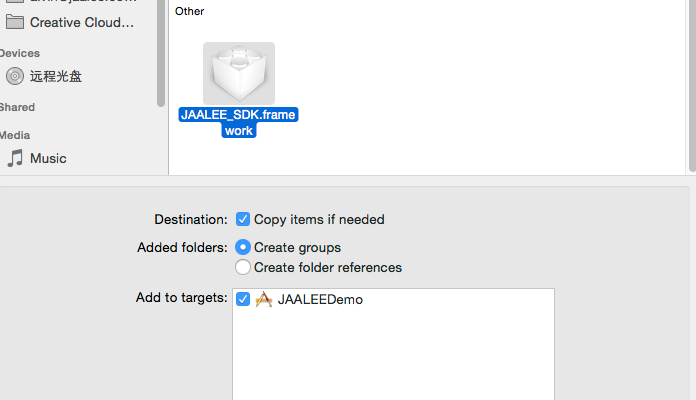 Copy the JAALEE_SDK.framework to your new folder. 4. Choose File > Add Files to Your ProjectName. 5. Select your new folder containing the SDK files. 6. In Added folders, select Create groups and in Add to targets, choose your project and click Add. 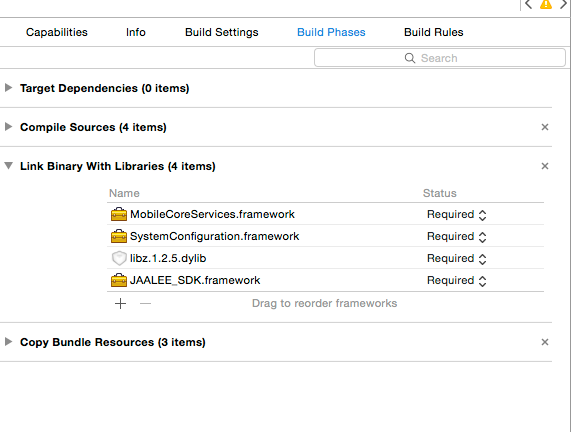 When you use JAALEE IOS SDK ,you need to add the following basic libraries. Now we can start using objects and methods from the SDK. Go to FirstViewController.h and we can start adding them. You can add your logic to the JAALEEManagerDelegate methods and run on your device. If you want to reconfigure JAALEE Device, you must have the operating authority. In other words, you can’t change the configuration if you don’t have the operating authority to this JAALEE. Go to SecondViewController.m and we can start it. You can add your logic to the JAALEEConfigureManagerDelegate methods and connect the JAALEE device and reconfiguration it. complete iBeacon Mobile solution.Mature technology,professional hardware and sincere services ensures everyone to enjoy the convenience brought by iBeacon technology.